Travel is amazing. Since childhood, I’ve had the travel bug because growing up, that’s all I did. I was born in Manila, Philippines, stayed briefly in Washington, DC and moved to Lusaka, Zambia for a couple years. In Kobe, Japan I started kindergarten. In Taipei, Taiwan I had four years of elementary school. I then went to Kuala Lumpur, Malaysia for middle school where I learned a lot of bad things. Finally, I returned to the States for high school and college. As the son of US foreign service parents, life was interesting. As an adult, my frequent travel continued because luckily I found jobs in the international equities department of two large financial organizations. Up to four times a year, I’d travel to Asia to attend conferences or bring clients to see companies. Kissing the ring in New York City HQ was also an annual rite of passage. It was a whole lot of fun! Traveling to new places on business is one of the most rewarding experiences you can have. Not only do you get to explore new worlds and meet amazing people, all your flights, hotels, and meals are free. Since I’m no longer in Corporate, I needed to some how recreate this perk. The great thing about the personal finance arena is that money touches everything we do, including travel. I can write about how to save money on flights and hotels. Or I can discuss how to travel for free with credit card rewards points. There’re innumerable topics I can write about that relate to travel and money, including this post! My epiphany came while I was hanging with a bunch of travel bloggers who said a lot of transportation and hospitality companies provide free everything in exchange for writing a review. For example, one travel blogger stayed at a 5-star resort in Bali for free in exchange for publishing a post about his experience. The retail value of his stay was ~$1,500, and the actual cost to the hotel was less than $100 for food and cleaning. What a win-win! Therefore, the easiest way to get free travel and accommodations is to start a travel blog, establish yourself as an enthusiastic traveler and contact the marketing departments of places you want to visit and make a deal to write about them. You probably want to chronicle your experiences anyway. Maybe companies won’t comp everything, but freebies might include an upgrade, meals, or an excursion. I get some nice bonuses all the time once I mention I have a site. You never know until you ask. Then, while watching a Rick Steves’ Guide To Rome episode on TV, I had another epiphany. Given I like to travel and write, why can’t I do something similar to Rick Steves and write about my experiences around the world through a personal finance lens? Instead of doing the same old “Top 10 Places To See,” why not interview the locals about their thoughts on happiness, life, work, family, and play? At the same time, I’d offer the usual travel tips to make a traveler’s trip as pleasant and economical as possible. What a no brainer. Check out these posts which I’ve already written! I’ve Seen The Future And It Looks So Bright – Given America’s government continues to grow in size and reach, I went to Europe to see what our future might look like with super high tax rates, higher unemployment, free health care, and good public infrastructure. What I found made me so bullish on America’s future and gave me the confidence to leave my job and not be afraid of falling through the cracks. Learning From The World’s Happiest People – Scandinavian countries are consistently ranked the happiest countries in the world by the World Happiness Monitor survey. As a result, I went to Stockholm to see why and share my knowledge with all of you. Financial Samurai is really a blog about maximizing happiness with the use of money. Living In An Expensive City Can Make You Richer, Happier And More Diplomatic – After returning from beautiful, but impoverished Angkor Wat, Cambodia, I was reminded how lucky we are living in a developed country. I turned a memorable visual I had of kids walking for miles in 100+F degree heat into a post about the upside of living in expensive cities like New York, San Francisco, London, and Hong Kong. What Is Capitalism? To Understand Let’s First Explore Communist China – Most people, when they go to China, visit Beijing and Shanghai. I went to the fire pit of Chongqing, in the center of China and wrote about the different perspectives of Communism and Capitalism. The city is developing quickly, but its views are still 10+ years behind the coastal cities. I think you’ll love the pictures I took. Exploring The Edge Of The World: Welcome To The DMZ – Here is a fascinating post about what happens when one people is divided by two different ideologies. If you go to Seoul, you must take the one hour trek to visit the Demilitarized Zone between North and South Korea. You will realize how lucky you are to be free. You’ll also gain a lot of empathy for North Koreans. And with more empathy, comes more harmony. You’ll be less quick to judge someone based on how they look or where they come from. Enjoy the video I embedded. My posts are so different from the typical travel guide or travel blogger article. With the publication of several more travel articles, I should be able to package all my travel-related posts into an insightful Travel Diaries ebook to make extra passive income. Bingo! Great question. I asked my CPA and he said, “All reasonable related travel expenses required to produce and sell your product.” The key word in his answer is “reasonable.” Spending $10,000 to fly first class to Paris doesn’t seem reasonable when you can fly for $1,500 in economy class and your business only generates $50,000 a year in operating profits. But what if you are writing a series about flying first class on the world’s top 10 major airlines to compare which has the best service and most comfortable seats? Then perhaps the cost of a first class ticket is reasonable because you can’t properly assess the experience from coach. And if your business is generating at least $500,000 a year in operating profits, and you are the CEO of the company, maybe first class is reasonable too. After all, plenty of CEOs of bigger companies fly first class or business class. I know I did as an Executive Director. As you can see from my examples, “reasonable” can be subjective. So let’s go to the IRS website (https://www.irs.gov/taxtopics/tc511.html) for an explanation. Travel expenses are the ordinary and necessary expenses of traveling away from home for your business, profession, or job. Generally, employees deduct these expenses by using Form 2106 (PDF), Employee Business Expenses, or Form 2106-EZ (PDF), Unreimbursed Employee Business Expenses, and Form 1040, Schedule A (PDF), Itemized Deductions. You cannot deduct expenses that are lavish or extravagant, or that are for personal purposes. You are traveling away from home if your duties require you to be away from the general area of your tax home for a period substantially longer than an ordinary day’s work, and you need to get sleep or rest to meet the demands of your work while away. Generally, your tax home is the entire city or general area where your main place of business or work is located, regardless of where you maintain your family home. For example, you live with your family in Chicago but work in Milwaukee where you stay in a hotel and eat in restaurants. You return to Chicago every weekend. You may not deduct any of your travel, meals or lodging in Milwaukee because that is your tax home. Your travel on weekends to your family home in Chicago is not for your work, so these expenses are also not deductible. If you regularly work in more than one place, your tax home is the general area where your main place of business or work is located. In determining your main place of business, take into account the length of time you normally need to spend at each location for business purposes, the degree of business activity in each area, and the relative significance of the financial return from each area. However, the most important consideration is the length of time you spend at each location. You can deduct travel expenses paid or incurred in connection with a temporary work assignment away from home. However, you cannot deduct travel expenses paid in connection with an indefinite work assignment. Any work assignment in excess of one year is considered indefinite. Also, you may not deduct travel expenses at a work location if you realistically expect that you will work there for more than one year, whether or not you actually work there that long. If you realistically expect to work at a temporary location for one year or less, and the expectation changes so that at some point you realistically expect to work there for more than one year, travel expenses become nondeductible when your expectation changes. For an exception to the 1-year rule for federal crime investigations or prosecutions, refer to Publication 463, Travel, Entertainment, Gift, and Car Expenses. You may deduct travel expenses, including meals and lodging you incurred in looking for a new job in your present trade or business. You may not deduct these expenses if you had them while looking for work in a new trade or business or while looking for work for the first time. If you are unemployed and there is a substantial break between the time of your past work and your looking for new work, you may not deduct these expenses, even if the new work is in the same trade or business as your previous work. Refer to Publication 529, Miscellaneous Deductions. Travel expenses for conventions are deductible if you can show that your attendance benefits your trade or business. Special rules apply to conventions held outside the North American area. Good records are essential. Refer to Topic 305 for information on record-keeping. For more information on these and other travel expenses, refer to Publication 463, Travel, Entertainment, Gift, and Car Expenses. OK, great! Everybody understand the rules? If not, please read again. The key words are “lavish and extravagant.” Again, subjective words that are open to interpretation. For a multi-millionaire, booking a suite at the Ritz might not be extravagant. For a bootstrapping entrepreneur living paycheck to paycheck, anything other than a hostel room could be considered extreme! What the IRS frowns upon is people dumping all their lifestyle expenses into their business and never making a profit. With no profits, the IRS can’t collect any of your hard earned money. The general rule is that your business needs to make a profit after the third year. If not, you’d better lower your expenses and prepare for potential scrutiny. The great thing about having a website is that you can easily pivot or add multiple income streams. After seven years of operation, Financial Samurai earns a healthy income from financial services. I want to now build my travel business through partnerships with travel companies and my favorite airlines and hotels. To build my travel business will require startup costs. If my travel business was an isolated department, it would certainly be loss making. Good thing I don’t create silos at Financial Samurai. My financial services business will help subsidize the build out of my travel business until profitable. Meanwhile, the losses from my travel business will help reduce my taxable income from my financial services business. It’s one team, one dream baby! Now you know why conglomerates like Alphabet (ex Google) are created. Given I earn a good operating profit from Financial Samurai Inc, my travel business could incur losses for a very long time without triggering an IRS audit because I would never let the losses of my travel business exceed the profits of my financial business. I love supporting America and paying over $100,000 in income taxes a year. I could also hire my family members as freelance travel writers for FS as well. After all, my parents just got back from a three week cruise from Panama City to Barcelona. Just look at unprofitable companies like Tesla and Amazon. They are worth billions, but pay ZERO corporate income taxes because they make operating losses. What about companies like GE who engineer the most complicated tax strategies to avoid taxes. Got to love it. It’s the small business owners like me who are paying all the taxes and keeping our country strong. I hope this post gives you some ideas on how you might be able to travel for free or at a discount at the very least. More importantly, I want you guys to realize how having a business can legitimately reduce your taxable income. America is great because anybody is allowed to give entrepreneurship a go. Nobody says you have to be a crazy success either. I’m thankful starting an online business costs so little and takes under an hour to set up. It allows us to experiment without fear of financial ruin. The magic happens when you can make money doing what you love every day. Digital wealth advisor Wealthfront came out with a new tool to help you take time off to travel full-time. 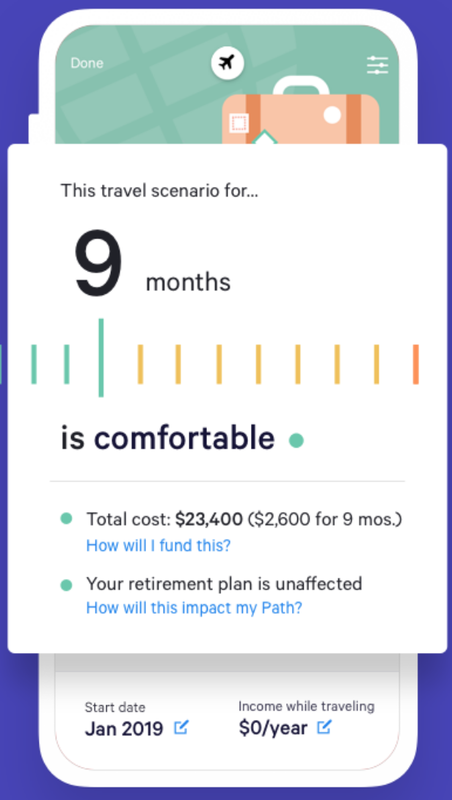 The tool helps show how long you can travel on a pre-determined budget while also being able to hit your retirement goals. Given we’re living longer, the argument goes why not bring up end of life travel and disperse the trips over your lifetime instead. I’d much rather climb up the 587 Santorini steps at 40 than at 70! Check out the free tool and see how you can optimize your life for greater adventure. Launch your website today: Check out my step-by-step tutorial guide on how you can launch a site like mine in under 30 minutes for just $2.95/month. A website legitimizes your business and becomes your online portal. Not a day goes by where I’m not thankful for starting Financial Samurai in 2009. In just 2.5 years, I was able to quit my job and be free. Everyone should leverage the internet to build a brand, build a business, and become untethered from an office to live a life of purpose! Enjoyed this article, and as my wife and I are in the early stages of getting our Travel Blog rolling, your article gave us some good ideas. I would be interested in knowing how you broached the subject with a company regarding you writing a travel piece about them? For example, we are headed to Europe in late April, and I was pondering whether or not to contact the Cruise Line and make such an inquiry. Any light you could shed on this would be highly appreciated. I’m a wedding photographer (it does make a profit) and I have my regular 9-5. I recently started a travel and fashion blog and want to know how to continue to lower my taxable income from my 9-5 without triggering an audit. Thanks so much! This is something I haven’t taken advantage of yet, even though I own my own business and have rental properties out of state (which I haven’t seen). I do travel a lot for fun, so I should really look for these opportunities. Thanks for the ideas! Great travel tips and insights. Credit cards can be a great way to travel for free, if you use the rewards correctly and are responsible. So how much are we talking on tax deductions? If I spend $10k on a trip, how much of a savings can I expect? And how is the blogging business tax deductions going to save me in my personal life? Cheers! Did you set up a separate business for your travel blog or do both websites fall under Financial Samurai? I have several ideas for blogs and wondered what the advantages would be of having each a separate business or if I should have one company with several sites. I created one umbrella media company. More business you create he more fees I have to pay. Not worth it when starting out. IRS requires to have separate businesses for separate lines of business. You cannot just mix them up. So, you will HAVE to show the net loss on the tax return of your blog business and then net profit of your other business, either they are separate Schedule C each or separate LLCs or S corps, does not matter. You can try to mix them if they somewhat related. Otherwise, it is illegal according to the IRS. So, IRS still will see your net loss, and then IRS will see that you are netting the net loss with income from another business. The choice is yours. Awesome post. I’ve been able to travel a little bit for free back to where I grew up thanks to my investment properties there. I use those to come back and look for more properties because the ROI has been great. While I’m there I’ll visit family and friends. I’m not sure if we’ll be there at the same time but I’ll be in Paris on the evening of the 30th. I live in Germany and I’ll just be there for the night before I fly back the next day. I’ve been a long time reader and I would love to catch a drink and pick your brain about finances and your upcoming travel plans. Whoops, I’ll actually be there the 29th, so our times should overlap. Cool. Where are you staying? No brain picking allowed though. It hurts! Fine, I’ll leave my instruments at home. I am staying at my friend’s apt near the Chatelet Les Halles station. What about you? Excellent article, Sam. Every entrepreneur has one thing in common: The desire to lower their taxable income. I’ve been considering leaving my country (US) for a good year or two to take advantage of this. I’m considering Thailand. Thanks for the article. It’s very valuable. What you mentioned about less than $100 for food and cleaning was eye opening. If you move to Thailand and earn money like you normally do I’m pretty sure you’ll still have to pay taxes to the US even though you don’t live there. I have no idea how living abroad and working for a US company or depositing money into a US bank account works. Would like to see your entry and photos about Chongqing, I am reading your blog from CQ, my hometown for the past 12 month, learnt a lot about how to manage my asset in US. Really interesting post and definitely something to consider. I think the idea of increasing your audit risk freaks people out when it comes to doing something like this. There are an incredible number of decisions that come in to play when considering where to travel, what to do, and the costs related to all aspects. I’m thinking this could play in well with my new blog adventure! My wife and I always talk about traveling outside of the US more but with 5 young kids it is tough (energy and financially). I think once I get my finances at a good point and my house paid off traveling will become a reality. I am always up for something new each day. Sounds like you are too. Agree that travel is awesome. Traveling in style is even better though. Have you ever flown private? If someone can do that on a regular basis, that’s when they’re truly part of the 1% in my view. A travel blog would be really nice. You get to have fun and travel at the same time plus you can deduct a ton of business expenses. My wife loves to travel and I always am in the lookout mode for deals and freebies. Last year, we went to Las Vegas and found ourselves spending under 100 dollars for 6 days, well, thanks to rewards, family and friends’ discounts on hotels, coupons on foods, among others. As a business owner, there are so many opportunities to maximize your after-tax income that employees don’t have access to. And you didn’t even mention all the great ways business owners can save much greater amounts in pretax retirement accounts. And thanks for the detail about deductible travel expenses. Lots of great ideas. How Much Can I Contribute To My Self-Employed 401k? Hi Sam, This is probably not the place to ask this, but can you or your readers recommend the nicest resort to stay at in Hawaii? I’ve never been but figure it’s time to “research” potential new marketplace expansions. The Kahala Resort & Spa! Thank you Sam. I hadn’t even considered Honolulu. Thanks for all your helpful posts. 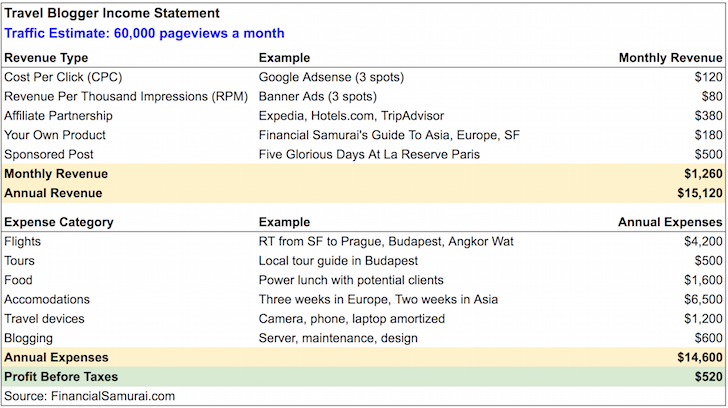 I love the fact that you can deduct your expenses if you “blog” about “your” travel experience. However, how would this work if you bring a family? Unfortunately I will be traveling with my family most of the time. if that is the case, will I just be able to deduct the expenses for myself? Sounds like you have it all figured out – I wish you well in your travels. Incidentally, this was one of my dreams in a few years if I ever turn my blog into something great. Who can turn down an all expenses (or close to) trip paid to other countries? Not I. My business had me traveling to a conference in a city I love exploring. Saw a friend I adore while there, and got the tax write-off for something I wanted to do. I’m considering which conferences that are beneficial to my LLC are affordable and in a place I’d like to be. This is extra important since I’m still not earning anything through the LLC. It supports itself, but does not pay me, yet. I have not yet begun dreaming of traveling for my blog… I should. 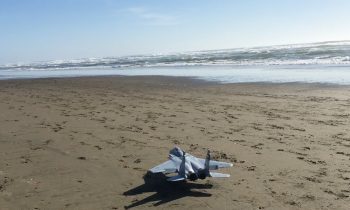 Credit card points are the most common “free” travel for sure, but I thought of something you may qualify for. I have heard people of Chinese decent can often get a extremely subsidized tour of China in 4 star hotels and paid meals. A trip for over a week could be $200 or something ridiculous. I can not vouch for quality or experience and I believe they are only in Chinese. Never heard of that Chinese specific perk. The Chinese are DOMINATING the travel industry right now with huge tour buses of Chinese folks everywhere I go. It’s impressive b/c their GDP per capita is so low versus everywhere they visit. What a clever way to combine passions for writing and travel. In the best case scenario, many expenses are camped. In a less optimal, but still excellent scenario, your expenses are tax-deductible. Frequent travel writing sounds like an excellent direction for a FIRE blog to take after RE is accomplished. Thanks for the links to the old posts; I particularly enjoyed the Stockholm article. I lived there for 6 weeks as a medical student on an exchange program. I’ve had “Stockholm syndrome” ever since… oh, wait… that’s something entirely different. (see Patty Hearst story for differentiation). But I’d love to go back there someday! Glad you enjoyed the Stockholm article! Yes, I’m finding that a FIRE blog with a heavy travel element is a perfect combination. Just looking around at all my fellow travelers, and 70% of them are 65+ and retired! If you are up for a lunch or beer or two tomorrow in Prague let me know. 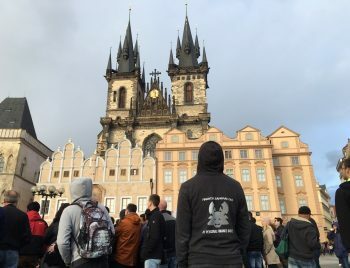 moved here 16 years ago, to be a travel writer… ended up somewhere completely different, but have loved every second of Prague. Sent you an email. In the boiler room, it’s always be closing. In entrepreneurship, it’s always be thinking. Great way to extend your existing business into new lines, while reducing your audit risk. Mrs. E is a amateur photographer, so once the dust settles, we’ve been considering setting up a stock photo site and selling her photos online. If you can generate enough revenue to avoid the “hobby” trap, suddenly traveling to exotic locations to take pictures isn’t a vacation, it’s a business… But generating enough revenue is always the trick. I feel really lucky that I’ve been able to travel to so many places across the US and internationally. So many people have never left the U.S. or even their own state. Travel blogging is a competitive space but the awesome thing about it is bloggers can really weave their own individual personalities and interests into their posts, products and insights. I’ve done some fun travel blogging posts over the years but haven’t focused on building out that niche that much. Maybe I should. Very cool idea, I’m like you, got bitten by the travel bug. I didn’t know you went to elementary school in Taiwan before. Did you have to attend school on Sat too? His at is US ambassador :) he probably get to go to the badass international school, US-UK standard, no Saturdays. LOL :) I went to school on Saturdays up until high school, bleh. I’ve recently bought a property in the Midwest, so I hope each time I visit home, I can use it as a tax write off – checking on construction, tenants and such. Win-win situation for us. I did the Saturday school in Taiwan and Malaysia. Not fun! But, I wish I did more. Mandarin is rusty, but was once quit fluent with 3,500 characters under my belt. I attended all the international schools like TAS, ISKL, etc. I’m going to write only a couple of Travel posts in August (Florida) and October (New Orleans) this year. Maybe next year I’ll write more if I can get to go to Maine or Memphis. Will you be writing about traveling in the San Fran area? Yes, SF is on my list for sure. I should be an expert by now after 15 years! Brilliant! I feel like a schmuck still working for the “the man” while other people have figured out how to travel for a living. :) The year I spent teaching English in Japan making like 1/5 of my current income was still among the happiest in my life. Ah yes… those good old times when we were younger and much poorer. I remember the same studying abroad in Japan and China as well. So fun. The idea is to create the most asset light business possible to keep costs down and then travel for business. What’s more asset light and easy to set up than a blog? And yet, what also has some of the highest margins as well? Bingo! Fun post! Chalk up another great benefit to the long list of benefits to having your own business. Lots of possibilities and good food for thought. My wife has a small business with a vendor in Kansas City. Turns out her sister lives in Kansas City too. Now, every time we visit her sister, we write-off the trip! A little tax knowledge goes a long way. When we took our first cruise several years ago I asked my CPA if I could deduct all or part of the trip if I wrote about the experience on my blog (which at that point had more than enough revenue to cover the cost). His answer was similar to yours above…”maybe”. In the end we discussed it and it appeared that I could reasonably deduct maybe 20% of the trip or so. Not bad. Your travel posts are more in-depth and more frequent. You also have higher income than I had (guessing) so it seems like you certainly could deduct a trip to some extent. The key part is, as you say, “lavish and extravagant”. Is a cruise by definition lavish and extravagant? Is it a relative measure as you allude or an absolute one? As in most cases, the tax-related decisions are about as clear as mud. Great ideas, Sam. This post has stimulated me to think outside the box a bit. When embarking on a complicated path involving possible tax liability, I think it is important to have a CPA-friend close by. I am fortunate that one of my good friends is also my CPA. Wow, we have similar plans this summer. We’re doing London, Amsterdam, Prague, Vienna, Bratislava, Budapest, Bangkok, and Singapore. Four weeks doing that and then we have 3 days back at home before leaving for a 1 week cruise and a few days in Miami to see the beach and family close by. Gotta love rewards points; this will be our last time in Cathay Pacific first class now that prices have almost doubled. As a site owner the most lucrative thing you can do is start pushing credit card affiliate links. They’re almost always $100+ per approval and some Biz cards are upwards of $200. You’ll never get an actual answer do to NDAs, but it is very lucrative. FWIW, I have never had an affiliate partnership, this is only what I have gleaned online. I work from home also, so shoot me an email if you ever want to chat. I can see the flow… but then to Bangkok from Budapest? that’s a great long trip! I hear you on credit cards, I’ve just never had that much of an interest writing about them b/c their interest rates are so high. A lot of folks get in way over their head with credit cards, and I’m afraid some readers here might too. The order was a bit off. We go from Budapest to Dusseldorf for a night before catching our flight to Bangkok. The plan was to return home after Budapest, but we wanted to fly Cathay Pacific in F one last time while we still could. And that meant flying east. We have Embassy friends in Bangkok and last time we visited Singapore we only had 1 night, and that was after a nightmare overnight train from KL so we didn’t get to see much. If we had more time we’d go back to Hong Kong, we love that city. Credit cards are great if you pay off balances in full, otherwise you’re paying interest and there’s no point in doing that. Definitely not for everyone. I’m a reseller on Amazon and my wife is a public school teacher. Both not high paying fields. Yeap, you need to make money or else the IRS really frown upon the travel expense. JD was audited a couple years ago and they said he couldn’t deduct those travel expenses. I guess he wasn’t making much income at that point. I’m planning to deduct our Thailand expense later this year for myself and my editor. I’ll write a series of in-dept articles on retiring there. Probably can’t deduct our kid’s ticket, though. Enjoy your trip! I’d love to visit Prague someday. It’s high on my list. Wow Sam, you’ve already traveled the world and you still want to travel more? I’m amazed. The more I travel it seems like I want to travel less in the future. Once you’ve seen a few giant cities in the world, they all start to look the same. Sure, I guess the museums are a little different, and the architecture does vary. I just can’t get very excited about traditional tourist travel anymore…. Warm places are still nice to visit though. We live in a pretty cold place. After I early retired I became a lot more content with life. Now that I don’t work, I don’t need to “escape” on vacation anymore. Great tips on writing off travel expenses though! Thanks for an alternate perspective. I do think Sam’s idea for niche financial travel blogging is perfect for him, and a good inspiration to do similar niche travel blogging. Sometimes I think that before traveling the world, I’d like to know every corner of my state and every state in the US. Very interesting to read that “After I early retired I became a lot more content with life. Now that I don’t work, I don’t need to “escape” on vacation anymore.”! Although I think I will never grow tired of travelling and discovering new places (it doesn’t have to be far far away for me by the way), I really like to know that you are so content with life now that you don’t feel the need to escape. I hope I can get that feeling too when the time comes! Glad to see you decided to hit Prague AND Budapest. Yeah, I was thinking… why not right? Why does it have to be one or the other. I’ve got no time constraints and the train system is good. Having a profitable travel blog would definitely be a fun gig. Not for me – but definitely worth looking into for people who want to travel a lot and don’t mind taking pictures and writing. Adding travel blogging from a financial perspective would def give a new dimension to financial samurai and help it evolve and give even greater interest and complexity. I know I’ll continue reading it for sure. As for free travel besides credit cards your options are numerous, from portal shopping to manufactured spending, resale, promotions or simply buying cheap packages from less known sources. The hassle of credit cards shouldn’t hold anyone back from enjoying the marvels of free or cheap travel. Ah, bummer. It would have been nice to drink together. I’m meeting up with a college friend who is the Bloomberg Bureau Chief. Should be fun. That sounds like a new avenue for both new opportunities and recharging the mind, and since that last post of potentially stepping away from the laptop for good (although the post was done in fun), this could be can be the best of both worlds. You can keep the laptop and get to see some great locations at the same time. The balance of being able to work for 2-3 hours a day (it’s 4:08am here as jetlag finally sets in), and then explore for 6-8 hours, then eat new foods is such a joy. Ever since I wrote the Shutting Down For Now post, I’ve been itching to travel. So far, it’s been good for the creative juices! Love the post! We are now 6 weeks early retired and travel will be a big part of our new lifestyle. Our blog has grown dramatically and the travel articles we have written are very popular reads. Now you have my mind clicking! Always be thinking in retirement! Very timely post as we’ve been discussing this over at The Green Swan lately. One perk we have is a family member that works for a large hotel company… that means cheap hotel rooms (but good ones too, not the dirty kind). We also have a CPA in the family which helps us understand the “reasonable” expenses we can categorize in the business. I love the idea of adding travel to the repertoire. You certainly have traveled the world already! Got to love those free hotel stay perks working for a hotel company! I remember meeting some folks who work at the Hilton and The Ritz. Lucky folks. I feel I’m not well-rounded with Europe compared to Asia. So trying to round those curves now and catch up. I have take a a few trips for work for free, the best one was to our Ukraine office for 12 days in the Hilton. Great way to leverage your existing platform and find a way to do something you love to do! Look forward to reading about your adventures! I am thinking about going to Europe this fall on a very similar trip to yours. Munich, Vienna, Prague, and Budapest. Looking forward to reading more about your trip. I will most likely be going alone, are you solo traveling? No solo traveling this time. I’m here with my business partner as we explore together and have our semi-annual offsite in Paris. I’d love to do Munich/Berlin… and if we had more time, we would have started at Berlin and then trained it down. But starting in Prague will have to do. Let me know how Germany is! I’m on a temporary work assignment in Prague, which I’m learning is a very good thing for me. I can deduct my housing and transportation expenses and up to 50% of the State Department set per diem rate for Prague, which is WAY higher than it costs to actually eat here. Every trip we’ve taken in Europe while here begins with me emailing a colleague from the area and setting up a speaking engagement or “research meeting.” With that, all of my costs are either paid by the host institution, paid by my institution, or tax deductible. I’m working on several study-abroad programs for my university and I collaborate with a lot of international colleagues, so as long as I visit some colleagues at the local universities everywhere I go, I’m doing research. Ahhhh, the benefits of self-employment with the added security of a steady paycheck. I keep reading about retiring early, and I’m just not getting why I would ever want to do that. What is baffling to me, is that most of my colleagues in the US will take a sabbatical and just stay at home, when there is just sooooo much rich-people professor welfare out there and easy tax deductions. I’ve got a new post that touches upon retiring early and travel blogging. The similarities are uncanny! Any must try local favorite restaurant here in Prague? I’ve had my fill of ham, sausage, potatoes and sauerkraut so far. Fresh beer too! It doesn’t take long to have your fill of those things. It took me about 1 day to never want another bland, boiled bread or potato dumpling. U Flek brewery has my favorite unfiltered dark beer, but the food is … ham, sausage, potatoes and sauerkraut. Terasa U Zlate Studne is soooper fancy and has a great view of the city and actual food, but it is mostly for the rich tourists and where locals take visiting big shots, so not really local. Kulový Blesk (ball lightning in English) seems pretty popular for the actual Czech locals. Somewhere around 100 beer options, but traditional Prague food. For wine and tapas, my wife and I love Wine O’ Clock in Old Town. Unfortunately, the best food I’ve had here in CZ has been in Brno. The Moravians know how to smoke some pig, and they have some good wines, too. Good God is it hard to find a decent hamburger in this country! Thanks for the tips! I’m going to try this place called Fat Koala at 5:30pm Tuesday if you wanna join. We walked the city again. I wonder if I’m missing something after two days. Probably a lot, but it’s a small place yeah? Fun post, Sam! Great way to integrate lessons on tax deductible expenses here. It’s interesting that you mentioned 3 years before showing a profit. My CPA mentioned 5 years, but I was thinking that was a bit long. How did you figure out 3 years is the inflection point where scrutiny increases? From the IRS: The IRS presumes that an activity is carried on for profit if it makes a profit during at least three of the last five tax years, including the current year — at least two of the last seven years for activities that consist primarily of breeding, showing, training or racing horses. Any recommendations on finding a good personal CPA? Should I go local or search/research online?